You may order these kits using the Paypal buttons below; using the Order Form; or email hbohan at peoplepc.com explaining what you’d like to order and we’ll send you a Paypal invoice for you to pay from. Lead times vary from 10-21 days, occasionally sooner, so please plan ahead. Students will see an artifact model of traditionally sewn cattail mat and learn about cattails and their importance in daily life for insulation, mattresses, seating and more for the people of Cascadia. Students from ages 8 -80 enjoy this activity. 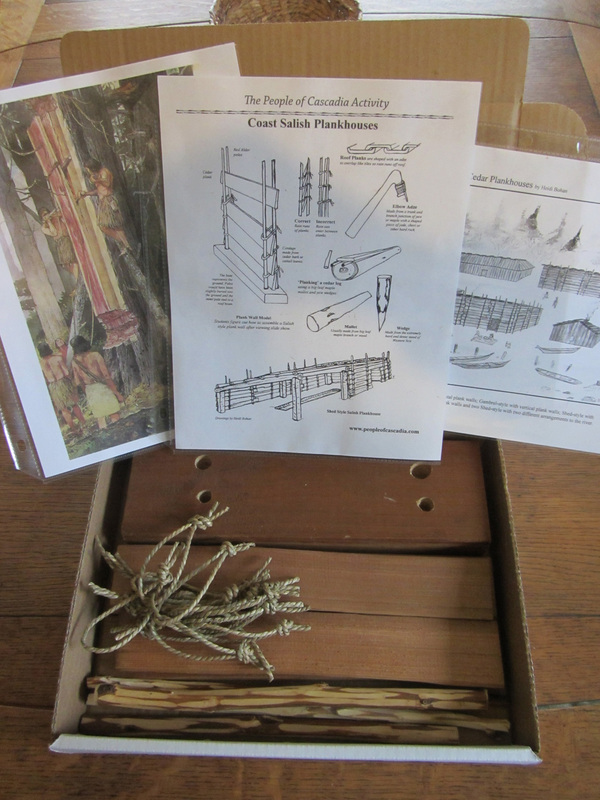 Each student will make a small cattail mat using a 6″ needle, natural fiber cordage, and cattail leaves. 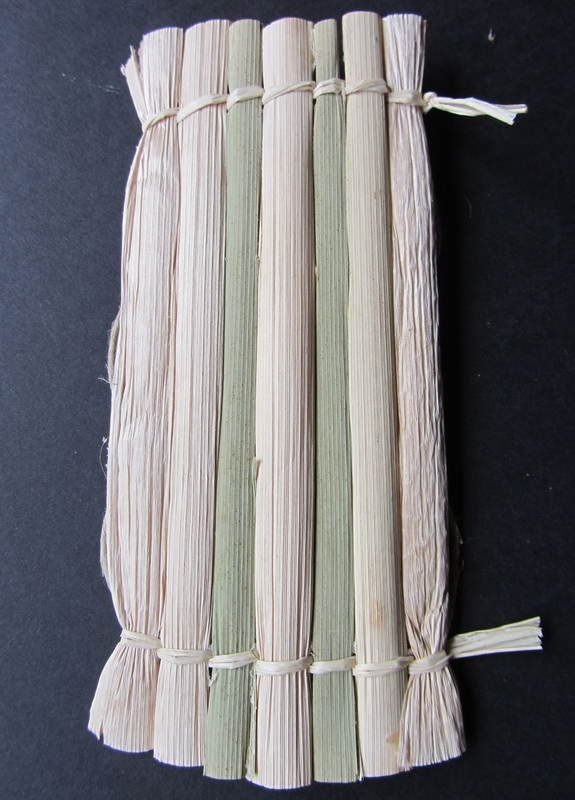 These mats are roughly 3″x6″ and help students understand how the properties of cattails are ideal for this purpose, and learn the unique sewn technique, used for these mats. These model mats can then be used to make ‘summer shelter’ diorama’s to replicate cattail mat shelters used during the gathering seasons. Note: supplies for diorama’s are not supplied, but easily available (plates, pipe cleaners, modeling clay, natural objects. 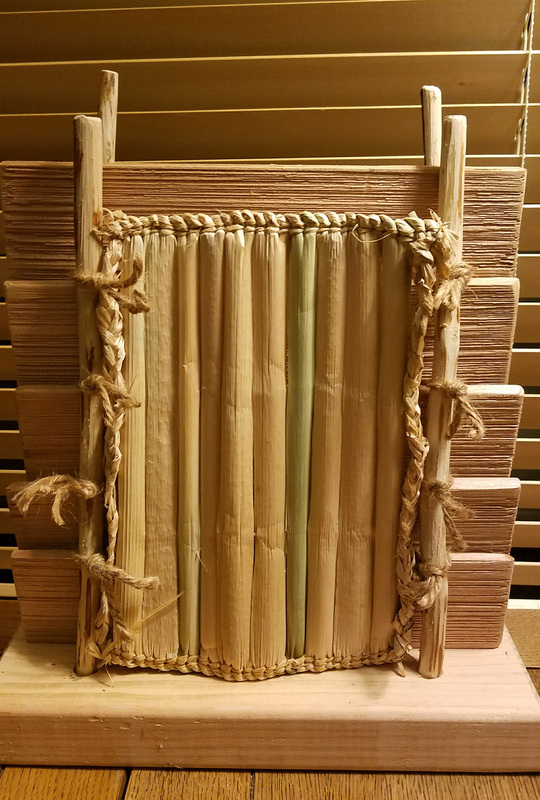 Kit includes: Artifact replica of a cattail mat 6″x 8″ (+/-); sample project mat; cattails prepared and cut to length for 25- 3″x6″ (+/-) mats, 25- 6″ plastic needles, hemp cordage and raffia cut to length, activity sheet with instructions, historic images and line art. Students will learn about the amazing inner bark of Western redcedar tree and how it can be used to weave baskets, hats, mats and more for daily life. Students from third grade to high school enjoy this activity. Students will see a sample cedar bark strip and how cedar can be split into finer strips for basketry. They will weave a small cedar bark bracelet or armband using a braided diagonal plaiting technique, then embellish with shell buttons, sinew and colored raffia. Students learn about the art form of the Northwest Coast weaving with wool on a unique ‘two-bar loom’ for blankets and robes. 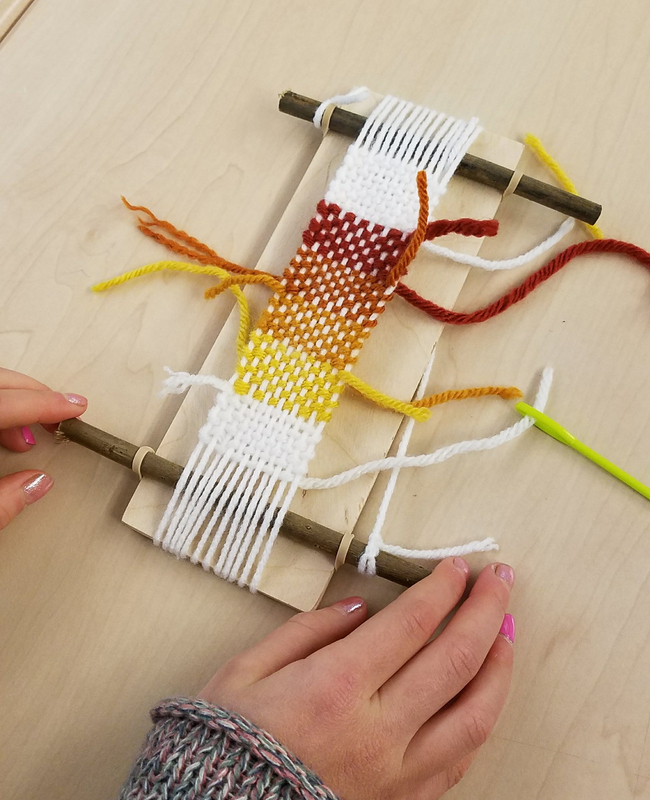 Using a model of this traditional ‘two-bar loom’ students will each make their own small weaving of a Salish blanket using natural wool and traditional natural colors. Note: these can be used as ‘blankets’ in the cattail mat diorama, or in association with the Cedar Plank wall. 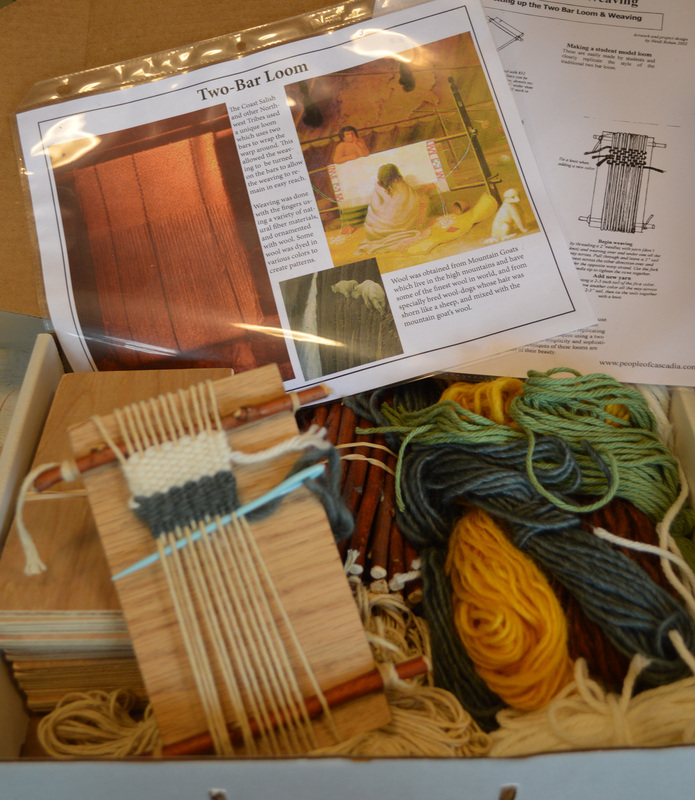 Kit includes: 25) two-bar loom model, Pre-cut yarn (white, and traditional colors) for 25 wool weavings; 25) 2″ plastic needles; Instruction sheet for activity; color images of two bar loom and Northwest Coast wool weavings. Natural Dyes Supplemental Kit Extend the Weaving with Wool activity by dying your own wool for the weaving. 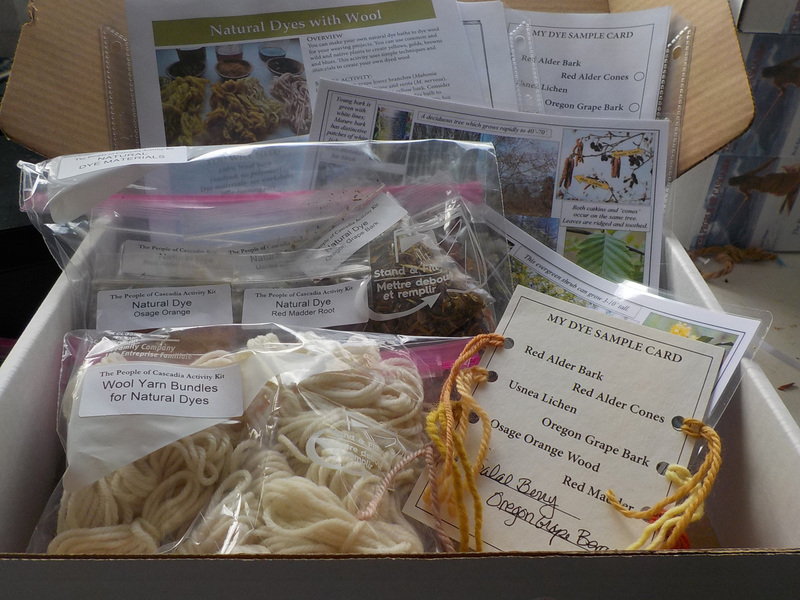 Supplemental kit includes up to six plant dye materials such as Oregon grape, black walnut, Osage orange, red alder and dried salal berries; wool yarn, Activity sheet, and dye sample form students can use to display their dyed wool. Students will learn about cedar plank houses and their unique construction, which includes the removable plank wall, and tiled roof planks. They will learn about the properties of red cedar wood and how it was split into planks using wedges and mallets. Students will discover the unique construction technique used to create a removable plank wall. Using one cedar plank wall model and natural cordage students will understand that this construction technique works perfectly to shed rain. 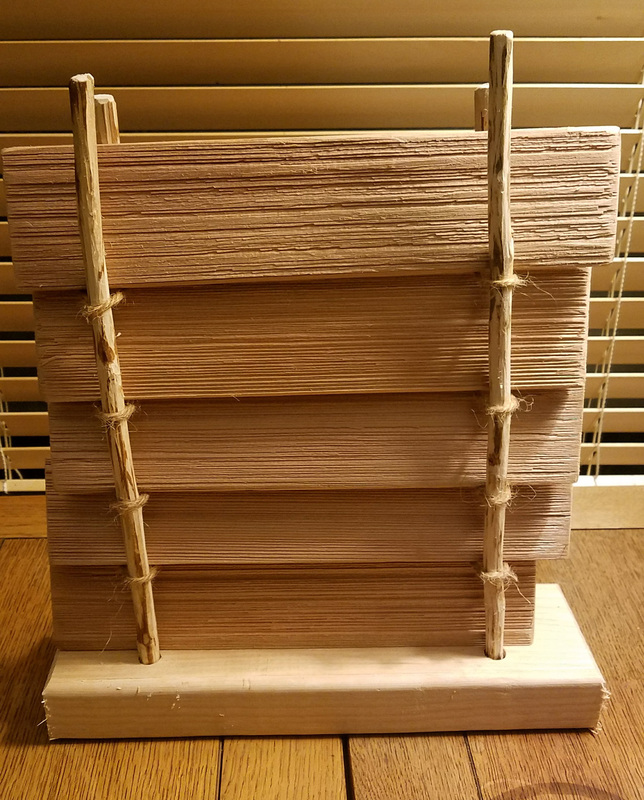 Kit includes: Six old growth cedar planks, two alder poles, cedar base and natural cordage to make a 10″x12″ model of a cedar house plank wall; line art pages for cedar plankhouse and construction; color drawings of plank houses. Optional Cattail Mat Artifact can be used to show how cattail mats were used on the inside of the plank wall as insulation to capture and hold heat. This is included in the Cattail Mat House kit or can be ordered separately. *Replenishment kits are the replenishable supplies necessary for each student to make their project, and are available for up to two additional classes per kit ordered, per year. In other words if you order one full class Kit plus two kit replenishment, you will have enough supplies for 75 students. Kit replenishments do not include props, images, or activity sheets, so please be sure you still have these if you are reordering from a previous year. They may only be ordered in conjunction with a kit.